"Superman at the End of Days"
"And For My Next Trick"
Superman talks with his landlady, in reality a former princess from the fifth dimension, about his high school prom and then memories of an event that hasn't happened yet. She explains that Vyndktvx disturbs time like a shark does water when he moves in for the kill. Suddenly Superman is in the future and a group of villains are hunting him. Just as suddenly he is back with his landlady and they share a drink. She tells him of how Mister Mxyzptlk came to the land of Zrfff and cheered up the sad king. The king's daughter fell in love with him but another citizen of Zrfff, Vyndktvx, became jealous. Through his machinations the king died. Vyndktvx framed Mxy for the crime and forced him and the king's daughter, Clark's landlady, to hide on Earth. As she tells the story time folds around them until finally she is killed and in three different times Vyndktvx makes his final move. Story - 3: This is going to be one of the harder reviews I have had to write for this series. My first reaction was to tell you, in vivid detail, why I hated it so much but the thing is I didn't hate it. I mean I didn't like it very much but once again that comes down to personal taste and not a judgment call on whether or not something was good or not. Part of me feels like I should have liked it. All of the elements needed to finish off a big story are there. We see Superman facing off against not only the big bad guy but also a team of other villains. We get the backstory on the villain and on Clark's landlady. There is a shocking death and a really good flashback. The proper ingredients are there but the way Grant chose to stir them together left me...well, confused would be the wrong way to describe how I felt. I mean I got what was going on. Frustrated would be a better term but again that is all on me. I like a more straight forward story and to expect a writer to conform to my standards is both wrong-headed and insulting. It is very much like the parable of the scorpion and the frog. For me to want Grant Morrison to write the type of story I want to read is like the frog agreeing to carry the scorpion across the water. When I get "stung" by this sort of story I have only myself to blame because such is Grant Morrison's nature to write messed up stories that play with the very nature of storytelling. There were parts of the story that I did like. The Smallville scenes were great. I liked the villains teaming up against Superman because it uses this story to tie all of the elements Morrison has been layering into Superman's world for nearly a year and a half. Even the explanation of why Vyndktvx is the villain of the piece was solid. Again, it is how Morrison mixed these story elements into a creative stew that leaves me feeling a bit disappointed that this is what we are getting as the resolution to his run. And that's pretty much all I am going to write about this issue. I could go into detail on why I hated the playing with time and all of that but it would come off more as whining than anything else. 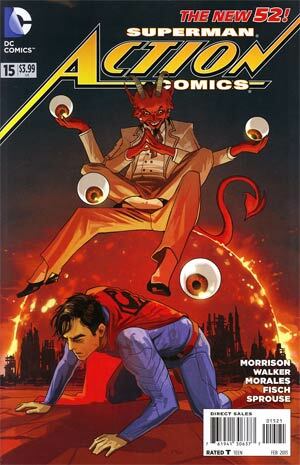 It isn't Grant Morrison's fault that I didn't like this story. He did what he always does and there is an audience for that sort of thing. I am just not convinced that Superman was the right character for him. 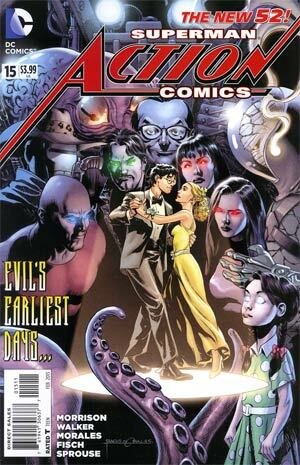 Art - 4: Overall I liked the artwork, especially the scenes in Smallville and of the villains hunting Superman. The change in the art with the Mxy related flashbacks made for an interesting visual experience and I liked how it looked so different from the main story which drove home the point that this was a whole other dimension. There were some gripping moments as well, such as the death of Clark's landlady. It was graphic but not overly so and rode that balance between shocking and gratuitous quite nicely. I should also mention that the art really helped me get through the writing. The storytelling was clear enough that I didn't need outside help to figure out what was going on. This is the story of how Mxyzptlk came to the land of Zrfff and charmed both the king and his daughter. She fell in love with the imp and even though an evil being made of spite tried to destroy them they managed to survive and escape to the three dimensional world. There they had a good life and gave birth to a child of music. Eventually Mxy's body died but somehow the baby holds the key to the imp's greatest escape act. Story - 4: Given how I felt about the main story I wasn't looking forward to this back up at all. Turns out I had nothing to worry about. Fisch does it again. It also proves that it is my "fault" (for lack of a better term) that I didn't care for the main story. All of the same elements are here just presented in a more straight forward, linear way. Between that and Fisch's ability to make me care about the characters in the story this was a fantastic read. It made me like this new version of Mister Mxyzptlk. It really did. Art - 4: I liked the art in this story quite a bit as well. It had a quirkiness that sold the unreality of the characters but still managed to feel very human. That's not an easy feat, especially given the characters and setting but Sprouse and Story pulled it off nicely. I really felt for Mxy and his bride and the ending had a twinge of sadness that felt very real. All in all I liked what I saw quite a bit. Cover Art - 4: This was a very solid cover. There are a lot of elements being thrown at us at once and all are very clear. 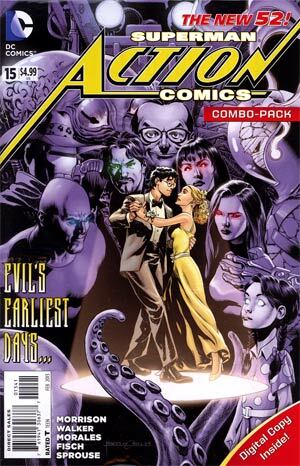 I like the shot of Clark and Lana dancing in the middle of the image. Variant Cover Art - 3: I am not a fan of this cover at all. It just isn't to my liking or sensibilities. It is a good variant cover, however. 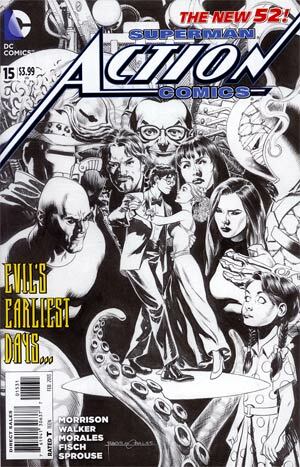 Variant Cover Art - 4 (Black and White): The black and white version of the main cover shows off how detailed and layered the image is. I like this iteration of the cover quite a bit.